Who doesn’t love unwinding on a Friday night with a terrific movie and a great big bowl of fluffy popcorn? If you’re a spicy chick like me you’ll love this jazzed up version…with a kick! Add the kernels to a brown paper lunch bag. Fold the edge of the bag over two or three times to seal it. 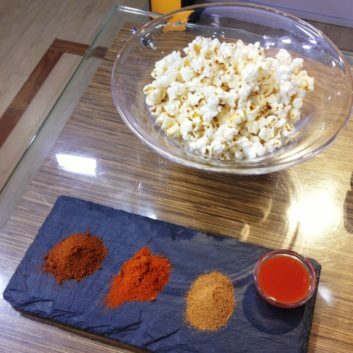 Pour the popcorn in a bowl, mist with oil spray, and drizzle on the hot sauce. Toss the popcorn to coat evenly. Add your optional cayenne pepper, cajun seasoning, or hot chili flakes for extra spice.